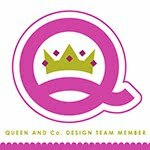 My Cluttered Corner: Brand NEW Gina K Designs / Therm O Web Holiday 2018 StampNFoil + Giveaway! 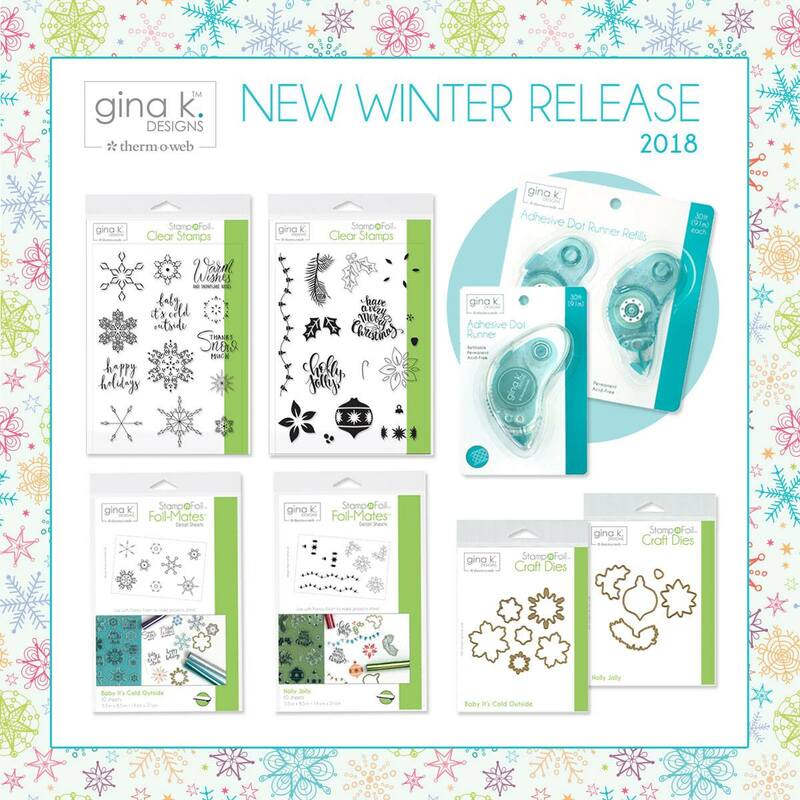 Welcome to the Gina K. Designs / Therm O web 2018 Winter Release Blog Hop! Plus, there's a brand new Dot Runner! If you haven't checked out the StampNFoil line yet, you must drop by Therm O Web and see it all! Basically, it gives you the ability to stamp, foil AND die cut an image to quickly and easily create stunning foiled elements for cards, scrapbook pages and more! I created this card using the Foilmates, Stamps and Dies from the Holly Jolly collection. For this pastel card, I used the Baby It's Cold Outside collection. The great thing about the Stamp N Foil collection is that you can truly customize your cards and make them the perfect colors by changing the stamping or foil colors you use. So whether you like more traditional Christmas colors or fresh pastel pinks and turquoise color combos, the StampNFoil line makes it easy to make stunning foiled creations. OK, now that you've seen some inspiration, it's time to continue hopping! Shemaine is your last stop and she has some gorgeous cards to share with you!! Don't forget to leave comments on EVERYONE's blog, including this one! 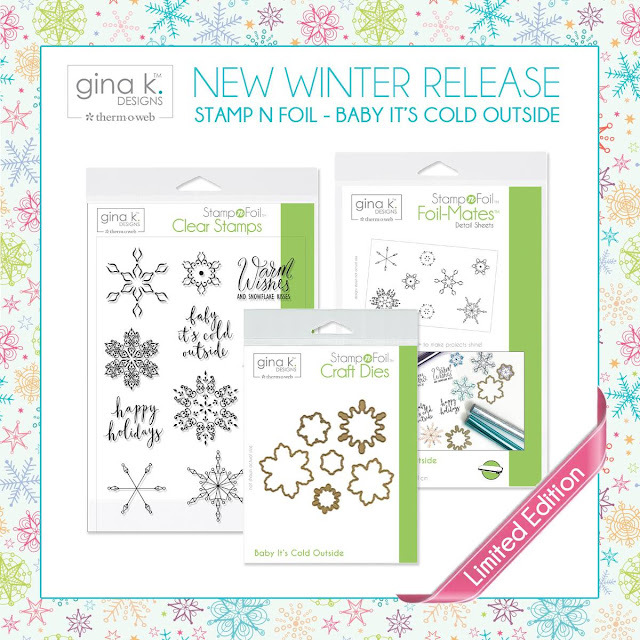 One winner will be chosen from somewhere along the hop to win the ENTIRE Baby It's Cold Outside collection including stamps, Foilmates and dies!! Also be sure to stop by the Therm O Web blog for a chance to win the MEGA giveaway which is a $200 value! 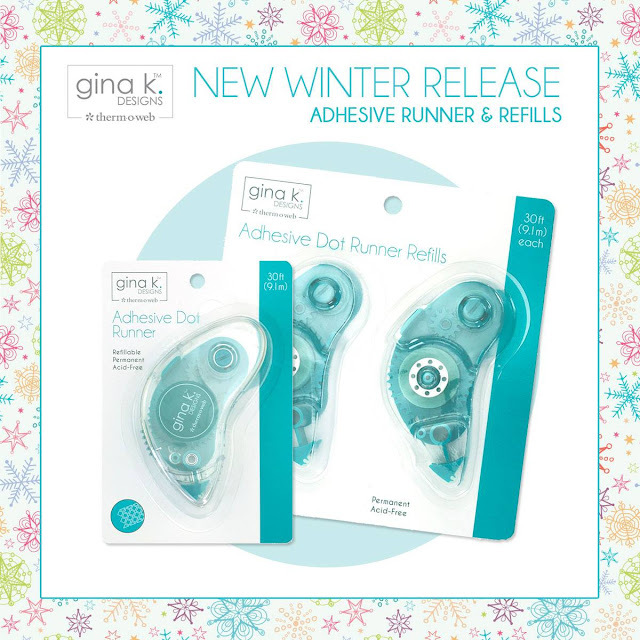 And visit Gina K.'s blog for another chance to win a prize! And be sure to check out all the new products in Therm O Web's shop, along with all the products I used for these cards, down below. Thank you so much for stopping by today! Good luck! Beautiful. I love your color choices. What a great release! Wow! Those are some beautiful colors you chose for your amazing cards! nice to meet you and I look forward to your future shares! Stunning cards! Love the colors! Thanks for sharing! I love that pastel card! It's so pretty. And I like the way the colors pop off a grey background. 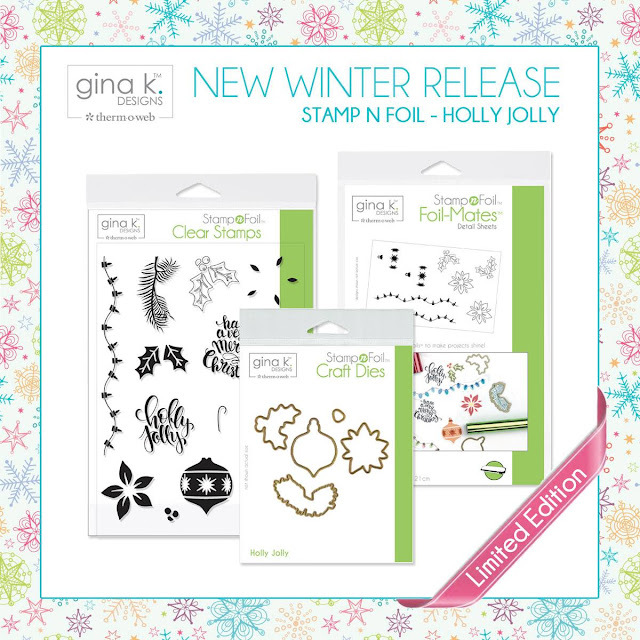 I love the fonts of the stamp sets in Gina's new release. You've done a creatively talented couple of cards that not only look so pretty in the traditional and one in the non-traditional colors, but you've added bling with the foils. Super job. Rebecca your cards are absolutely gorgeous! I like how you changed the looks just by changing the foil. I can't wait to get these 2 new release sets!!! Such cheery Holiday Cards! What a pleasure for friends and family to receive at Christmas! Gorgeous cards! Love the first one. Pretty cards! Love how you changed the color up with pastels! Just stunning! I love your color choices! The retro look is perfect!!! Lovely cards! Love the colors you used! I like that pink snowflake! I'm going to start doing that. Pretty cards! So pretty. I like your choice of colors. Adorable cards! The new release is amazing! Gorgeous cards. Love the use of non traditional colours. Both are fabs!!!! Both cards are gorgeous! I like making some traditional colors and some non-traditional colors for Christmas/Winter cards and you've done so perfectly with these 2 sets. Thanks for the inspiration. Beautiful cards, the foiled snowflakes are gorgeous! Great cards. I love these sets. Beautiful cards! I really love the snowflake card, great color choices. This has been quite a hop. I have loved every stop. The projects I have seen just blow me away. Great job everybody. Such pretty cards! I really love the one with the pretty ornament and snowflakes! Awesome release! Wonderfully happy and festive cards! Beautiful designs and the foil is the icing on the Christmas cookie! Love the combination of several sets! Beautiful cards! Really bright and cheerful looking colors. Your cards are wonderful. Thermoweb and Gina K has a awesome release. Wow! Awesome cards!!! Love the colors!!! Just WOW!! Stunning B-E-A-utiful cards!! Love the set and the cards you made. Love both of these pretty cards!